Fans of Meebo for a long time could have been utilizing the service through Safari on their iPhone. However, this proved to not have near the functionality or ease of a native app. 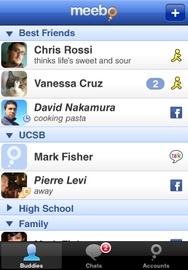 Among the features of the Meebo app are most of the usual IM suspects, including push notifications, multi client support (GTalk, Facebook, MySpace, Windows Live Messenger, Yahoo, AIM), and a seamless UI design for managing multiple accounts. However, some of the features that set it apart from the rest include the ability to easily set statuses for all accounts, and seamless integration from the app to the desktop browser Meebo service. This will allow you to switch conversations from your phone to your computer on the go, something many other apps fail to implement smoothly. You will also get the ability to search through contacts and past chats.